The tragic expression of Seol is made public. On March 14th, 2012, the official website of MBC TV series The Moon Embracing the Sun published the photos of Yeom (Song Jae Hee) and Seol (Yoon Seung Ah). 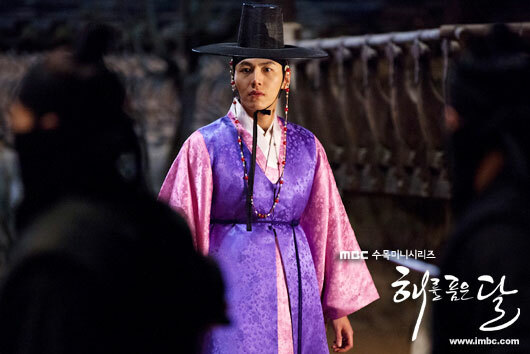 In the photos, Seol stood in front of Yeom to block the assassin. In particular, the surprise expression of Song Jae Hee as well as Yoon Seung Ah who covered in blood are making audience full of questions about the last 2 episodes. Previously, Seol secretly went to look at Yeom, and is worrying about his safety. Whether Seol can protect Yeom is of heighten interest. On the other hand, The Moon Embracing the Sun broadcast its 19th episode on March 14th, 2012, and last episode on March 15th, 2012.